As teachers, we look out for the morale and well-being of the children in our care everyday. However, there is a growing awareness that we neglect to look after our own well-being as teachers. We started the year well, but pressures mount quickly, and by the time half term was approaching, we were concerned about morale within school. 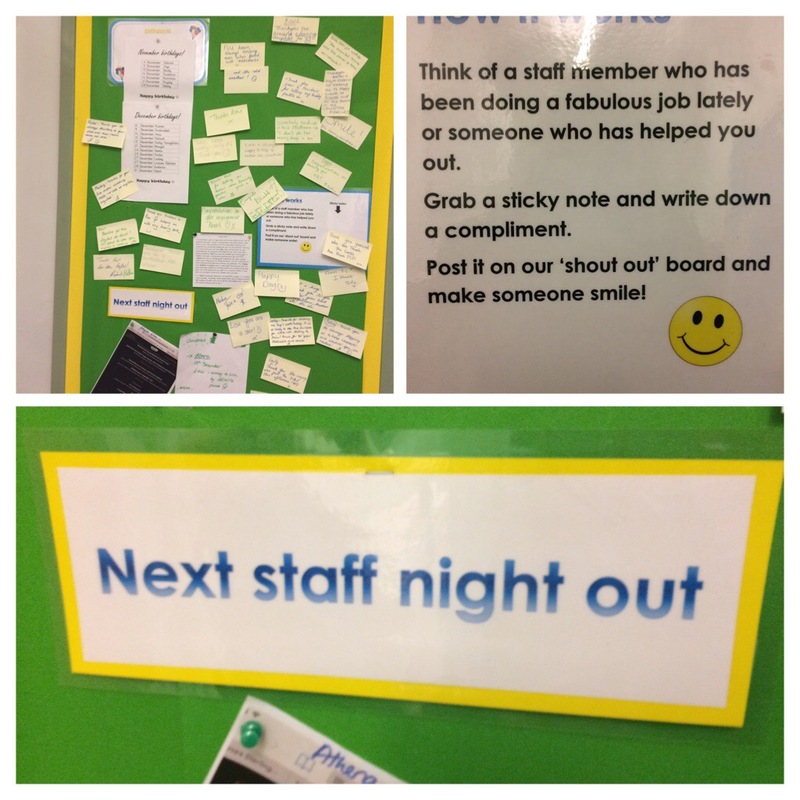 So, as an SLT, we took several steps to try to boost our morale and show our staff how much we value them. We had a niggle box in the staff room for a month (October became Moan-tober). At the end of October, we addressed the niggle box concerns and put some new ideas in place. We started to provide free tea, coffee, sugar and milk for everyone and we provided pizza or vegetarian curry (school is just at the end of the fabulous Golden Mile!) at all our twilight meetings. We started to look again at our marking policy, as this was an area of concern from a work load and expectations point of view. We have a list of birthdays each month that includes everyone – cleaners, lunchtime supervisors, TAs, teachers and admin staff. Staff nights out, or other social activities (for example, someone has just suggested we start a book club). Funny things overheard in the playground. The main area is given over to post-it notes (a ready supply with pens is kept in a box on the board) that people can use to send a shout out to someone else. So far, it has been very well used! I’ve had to clear post-it notes off the board every month otherwise it would be so stuffed full no-one would be able to see anything. Messages range from saying thank you for holding a door open when someone had their arms full, congratulating staff that have got engaged, count downs to the holidays and thanking people for their support when staff have returned from long term sick leave. It makes people smile as they go up to the staff room and I make sure that everyone gets to keep the post-its about them when I take them down. It is the little acts of kindness that remind us what a tough job we do and that we all deserve a break now and then! My next challenge is to keep it going with the enthusiasm that we begun. I’ve noticed the frequency of post-its has slowed over the last half term, so if you have any ideas about how it can become more sustainable, let me know! Presentation at Leicester University NQT conference on 18 January 2017. I was asked to speak about challenging more able pupils, but of course, bent the topic around to using ICT to challenge children. #Nurture16/17 Getting my IT mojo back and looking after my staff. Having written two Nurture posts in one calendar year, I managed to not write one at all on 2015-2016. My last school’s year was pretty hectic, my first full year as a phase leader, we gained over 230 children from Easter 2015 to October 2016. When I joined the school there was a 7 year plan in place to grow from a 2 to 3 form entry school, but local circumstances and our Head’s strong moral purpose that all children deserve a good education meant it all happened rather more quickly than we anticipated! Needless to say, taking on a phase leader role whilst still in class full time was hard work and I was fortunate to undertake an NPQML qualification along with another colleague in Foundation who was also new to her phase leader role. This helped enormously, gave us ideas to support us and the time to support each other. 1. Start class blogging in my new school. I can’t believe how much I have missed having an online space for my class to share their work! 2. Continue to develop our CAS regional hub. We had a super launch, but the challenge this year is to embed the network and deepen the connections we started. 3. Begin my journey to becoming a Master Teacher of Computing through CAS. 4. Finish the couch to 5K programme for running and try to join at least one Park Run. Make running part of my week and keep it as a permanent form of exercise. 5. Continue to strive for some semblance of work/life balance. I’m much better than I was, but there is always room for improvement! Taking into account the meassive changes in priorities that happened in the past 2 years, I’m pleasantly surprised that I’ve achieved many of these. The CAS hub is going strong, and now I have two other members of staff working with me on it, I became a Master Teacher of Computing and delivered training to my own staff and other schools, I completed couch to 5 K and I definitely have improved my work life balance. The main wish that didn’t get a look in was class blogging but something had to give! Looking ahead for 2016, I liked David Roger’s areas of focus: interest, practice and purpose. I am in the very fortunate position of being a phase leader without a class responsibility this year. Given our massive and sudden expansion, our head invested in us as middle leaders to help smooth the transition to a bigger school and develop a wider spread of leadership responsibilities. After all, as LKS2 lead, I now manage 7 teachers and 4 TAs, which is almost the same size of staff that was in the first school I worked in! It has been a brilliant opportunity and I have now have an amazing overview of all the children and staff in my phase. I have taught every class as I provide the majority of the covered needed in the phase and mentored an NQT. The downside has been that I haven’t been able to carve out as much time as I would like for computing and in particular the use of IT across the curriculum. I feel like I’ve lost my IT mojo but over the holidays I’ve realised it’s up to me to take the opportunity and get inspired! I have re-engaged with Twitter, by changing my client back to Echofon which pushes notifications and so I’ve been pulled back in. I’ve had a good clear out and cut down he number of people I follow and consequently my interest has grown and I’ve regained some of the joy that I know Twitter can provide. My individual teaching practice has changed radically as I cover classes rather than have my own class responsbility. However, I did prepare assessments and the data returns for one of our classes last term so I haven’t missed out on everything! I have gained a wealth of experience by teaching a wider range of classes and this is something I want to develop further. Run a lesson study looking at the use of technology across the curriculum with a focus on supporting our EAL learners. The moral purpose of providing a broad curriculum for all children in our school is very strong. We have a strong focus on the well-being of staff and I feel that this is increasingly important when demands from changing political agendas continually move the goal posts. Maintain and develop our Staff Shout Out board to encourage a culture of caring for and thanking one another in school. Look after myself and remember that at the end of the day teaching is just a job. Nurture my staff by leading by example – turning email off at weekends, thinking about the impact of new ideas and new work on staff before committing to them. I’m optimistic about the coming year after a really relaxing holiday – bring it on! Author jobadgePosted on January 2, 2017 Categories teachingTags #nurture16/17Leave a comment on #Nurture16/17 Getting my IT mojo back and looking after my staff. Everything on the Internet belongs to someone! It was my pleasure to run a workshop at Hampshire/ Wessex Computing Conference on 30th June 2016. Expanding on previous presentations on teaching children about Creative Commons licensing and how to be respectful online, this workshop covered attribution and how to re-use online content. Author jobadgePosted on June 30, 2016 Categories conference, OERTags computing, creative commons, esafety, KS2, OWR, respect, teachingLeave a comment on Everything on the Internet belongs to someone! I was delighted to present at the City of Leicester Summer conference along with my colleague, Nick Overton on Saturday 25th June 2016. We discussed how part of teaching children about being respectful online includes making them aware of who owns what and how they can re-use other people’s images. We described how we have taught our children about Creative Commons licencing. The lesson plans are available on TES Resources (under CC-by licence of course! ).